Doubts over Rory McIlroy playing in the US PGA have increased after the injured world number one withdrew from next week's WGC-Bridgestone Invitational. The Northern Irishman. who ruptured an ankle ligament earlier this month, is the defending champion in both events. Medical experts suggested the 26-year-old could face three months out and he confirmed on Wednesday that he would not compete at Firestone Country Club. The year's fourth and final major is held a week later at Whistling Straits. McIlroy sustained a "total rupture" of the anterior talofibular ligament in his left ankle while playing football with friends on 4 July. The four-time major winner was forced to miss the Scottish Open and the defence of his Open title at St Andrews. 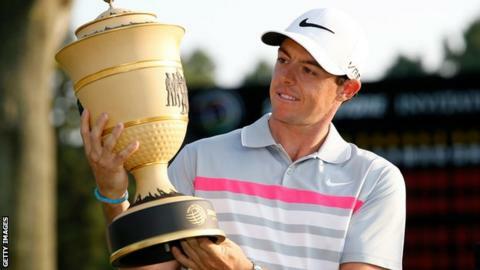 "Unfortunately, I will not be defending my World Golf Championships-Bridgestone Invitational title," McIlroy said in a statement from tournament organisers on Wednesday. "Best of luck to all the competitors and I look forward to returning to Firestone in 2016."